In the first scenario, the defense allows fewer points. But their offense is likely to start all 8 of their offensive drives deep in their own territory. In the second scenario, the defense allows a few more points. However, by by forcing 2 punts and 2 INT’s inside their opponents’ 20 yard line, their offense is more likely to score points and thus the “extra” points they allow are largely (or entirely) negated. Now, these are obviously extreme and unlikely scenarios but the idea is that a team’s offensive and defensive outputs are related and the true value of a defense is the effect it has on the margin of victory. For the purposes of these rankings, I took the “Adjusted” PPD – this factors in defensive points scored (safeties, fumble recovery and interception TD’s). Touchdown% – Obvious point: preventing touchdowns is the most important thing a defense can do to limit the number of points they give up. The ability to frequently limit your opponent to field goals is a very valuable trait – one which every elite defense has in common. Think of it this way: the average field goal attempt allowed is worth ~2.3 points (between 2000-2010, the average FG% was 78%, which multiplied by 3 points = 2.3). The average TD is worth about 7 points (the rare extra point miss is made up for by the occasional 2 point conversion). Theoretically, a defense could give up 3 FG attempts and stay within a one touchdown point differential. Yards Per Point Allowed – “Bend but don’t break”, it’s a somewhat useful measure of how “tough” it is to score on a defense. Elite defenses typically score very highly in YPP. It’s most useful in providing context to a team’s yards allowed. Teams whose defense look bad based on yardage stats fall into two main categories: teams who amass big leads and are willing to give up yards, but not necessarily touchdowns in exchange for time off the clock (e.g. early 1990’s Bills, current-era Patriots) and teams who are just awful defensively. The former will score well in YPP despite having ugly Yards Per Game or Yards Per Drive. The latter will typically score very poorly in YPP (and pretty much every other category). More yards = more potential scoring opportunities. In theory, a defense which gives up very few YPD is less likely to give up a last minute (or overtime) game-losing FG than a defense which gives up tons of YPD. Time of possession – More yards often means more plays which means more time off the clock – another way to hamper your own offense’s ability to score. If your favorite team is tied with 5 minutes to go, and their opponent has the ball, which defense would you prefer – the one which gives up only 21 yards per drive, or the one that gives up 35 YPD? The former is more likely than the latter to get off the field quickly enough to give your offense time to get a game winning score. Turnover% – Forcing a turnover is the best possible outcome for a defense. Not only does it satisfy the primary goal (preventing points) but it adds a secondary benefit (scoring points directly or indirectly). Often, teams who score well in YPP have a high TO%. While a high TO% doesn’t necessarily mean a great defense, it’s rare to see a truly bad defense which creates a lot of turnovers. At worst, a team with a high TO% will be about league average in points allowed. 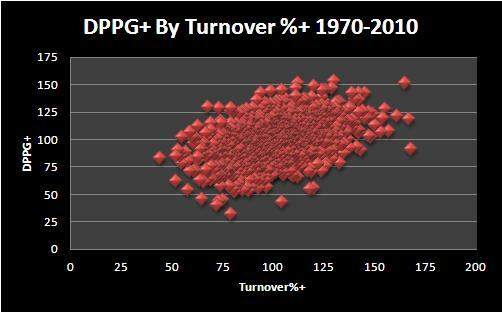 The last variable to explore in evaluating defensive efficiency is Turnover% – which is calculated by Turnovers/Drives allowed. Check out the “Diff” column on the right. 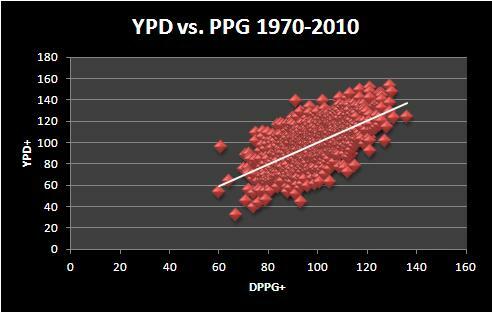 This represents the difference between a defense’s Points Per Game allowed (DPPG+) and Yards Per Drive allowed (YPD+). What you’ll notice is that many of the best Turnover%+ defenses have big differences between DPPG+ and YPD+. The higher the difference, the more a defense “bends but doesn’t break”. 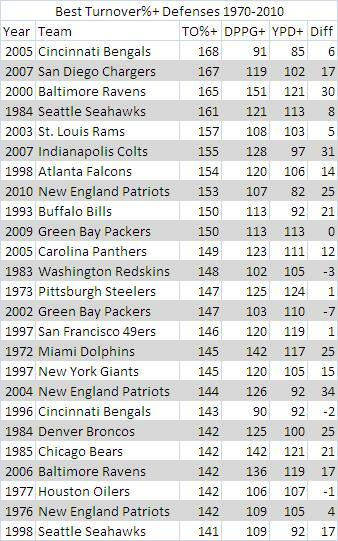 A handful of these teams (2007 Colts, 2010 Patriots, 1993 Bills, 2004 Patriots, 1998 Seahawks) were decidedly below average in preventing yards, but were quite good at preventing points. A big part of their success came from creating turnovers. 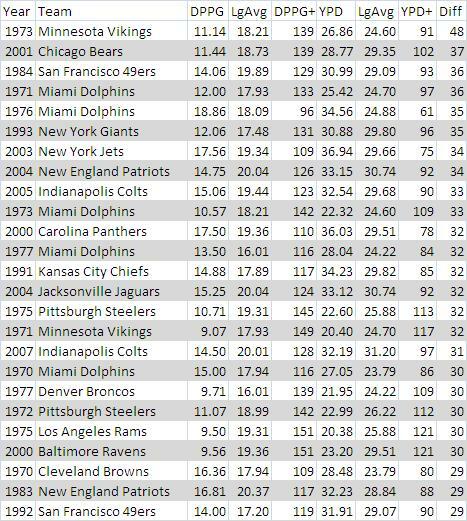 Interestingly, the 2005 Bengals sit atop this list despite being below average in DPPG+ and YPD+. They are a rare case of a team being great at taking the ball away but sub-par at everything else. Only three of the top 25 were below average in taking the ball away. As a group, these defenses averaged a TO%+ of 121 – meaning that they created turnovers on 21% more drives than league average. An additional effect of generating a lot of turnovers, is that the chance of a defensive touchdown increases. Between 1970-2010, there were 38,212 takeaways and 2,710 defensive TD’s scored. 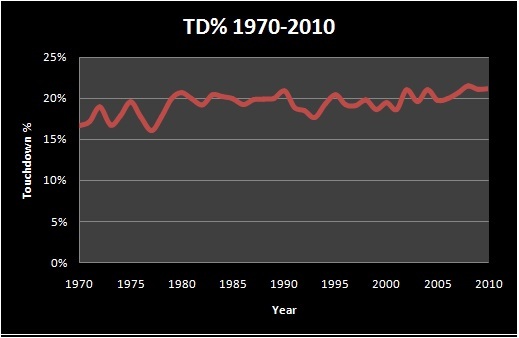 So about 7% of turnovers over that time period directly result in a TD. Over the course of the season, that’s probably only one extra defensive TD for an elite defense – but that one defensive TD is a potential 14 point swing on the scoreboard. Another side effect (one which is difficult to quantify) is that defenses which force lots of turnovers set their offenses up with better field position – leading to an increased likelihood of the offense scoring. To restate an obvious point: a defense’s goal is to stop the opposing team from scoring. As long as they do that, it doesn’t really matter how many yards they give up in the process. The best way to stop the opponent from scoring is to generate a turnover. Not only does this prevent the opponent from scoring, but it can lead to points directly or indirectly. To that end, creating takeaways is the most valuable thing a defense can do to affect the margin of victory in a game. Check back later in the week, as I put all these variables together and unveil my final Defensive Efficiency Scores. Having looked at Points Per Drive (PPD) and Touchdown %, we turn to a somewhat deceiving – and overused – stat: yards allowed. Too often, defenses are ranked and judged by the yards they allow. It’s a very poor and misleading way to evaluate defenses. After all, yards don’t mean much if they don’t lead to points. The first way of thinking about yards, is by comparing them to points allowed. 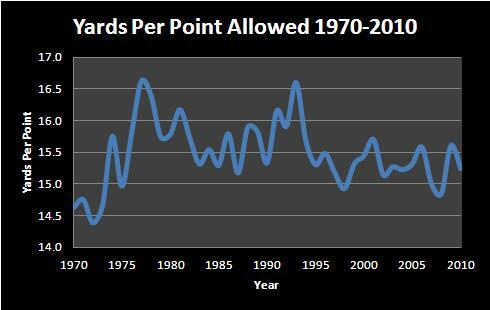 Taking a team’s Yards Per Point Allowed (YPP) is one measure of how efficient a defense is at preventing points. As with offensive efficiency, Yards Per Point is a big piece of the puzzle. 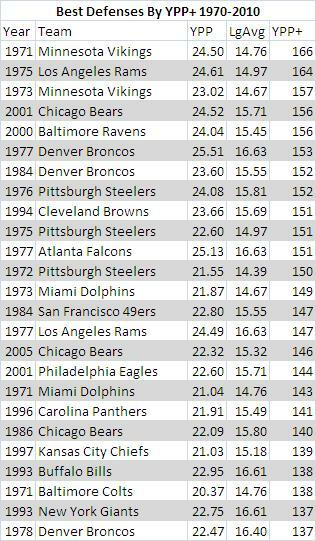 It’s rare for a team to rate well in PPG+ and poorly in YPP+ (about 10% of teams since 1970 meet that criteria). This is because teams who rank poorly in YPP tend to give up a lot of TD’s. As I mentioned in the points per game vs. touchdown % discussion, TD% is the biggest variable in inflating points allowed (a bit obvious since a TD is worth more than double the points of a FG). So teams who rate well in YPP tend to be those who can clamp down and force FG attempts, turnovers or punts – even if they give up a bunch of yards. It would be almost impossible for a team to score well in YPP and give up a lot of TD’s. Another way of looking at yards is Yards Per Drive (YPD), which in itself doesn’t tell us much about the quality (or efficiency) of a defense. In an ideal world, a defense would be excellent at preventing both yards and points. That doesn’t mean that defenses which give up lots of YPD are necessarily bad. 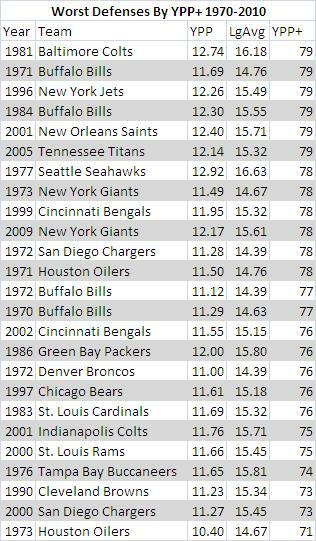 However, of the 100 worst defenses since 1970 in terms of YPD+ (yards per drive allowed relative to league average), only 11 have been above average in preventing points (measured by PPG). 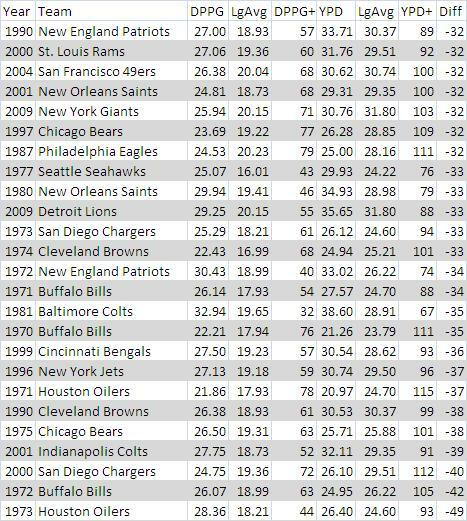 Conversely, of the 100 best defenses in YPD+ only 4 were below average in allowing PPG. That said, once you get into the middle of the distribution, the correlation between YPD and PPG breaks down. Truly great defenses are good at preventing both yards and points. Truly terrible defenses give up tons of both yards and points. There are plenty of “pretty good” defenses which give up more yards than you would expect based on their PPG allowed. Because the vast majority of defenses fall in the middle of the distribution, using YPD as a measure of defensive quality is fairly useless. What’s notable here is that between 90-110 PPG+ (i.e. league average ± 10%) we see a big range of YPD+ (roughly league average ± 30). The white trend line bears this out, giving us an R2 of 0.4. In other words, about 40% of the variance we see in Points Per Game allowed is related to Yards Per Drive Allowed. The other 60% comes from different (non yardage based) variables. The “Diff” column all the way to the right shows the difference between DPPG+ and YPD+. Teams with big (positive) differences between these two variables tend to be “bend but don’t break” defenses – teams who give up lots of yards but not lots of points. This is especially true for any team with a YPD+ of less than 100. There are a few teams (the 1971 Vikings, 1975 Rams, 2000 Ravens etc) who were elite in both categories and probably shouldn’t be lumped in with the “bend but don’t break” teams. 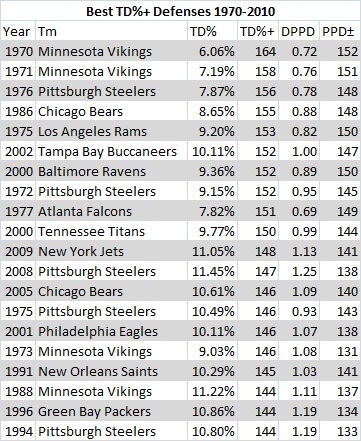 The #1 team on this list, the 1973 NFC Champion Minnesota Vikings, allowed 39% fewer points than the average team that year but allowed 9% more Yards Per Drive. 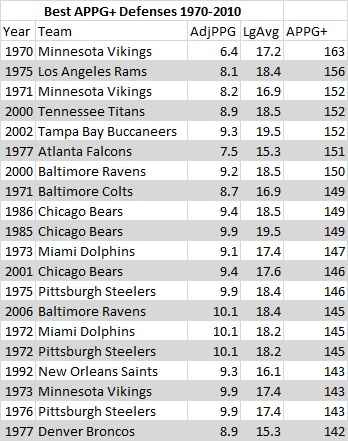 Were we solely looking at yards, we’d probably consider the ’73 Vikings to be a pretty bad defense – but that’s not the case at all. 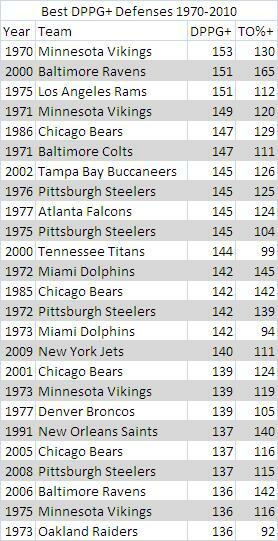 In fact, they are 17th (out of 1189) since 1970 in PPG allowed. There are eleven teams here which were better than league average in YPD but well below average in PPG. The 2000 Chargers really stand out. 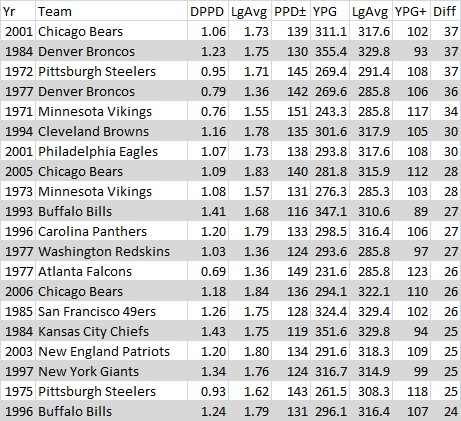 They were 6th best in the league in YPD+, allowing 12% fewer yards per drive than the average team. However, they were 28th (out of 31) in PPG allowed – giving up nearly 25 points a game (28% worse than league average). In summary, YPP is a valuable measure of defensive quality. YPD (or YPG) is not particularly useful, at least not without additional context. Unfortunately, you never hear NFL analysts using the YPP (or Points Per Drive) statistic. 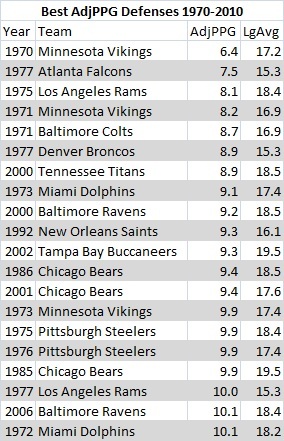 History is littered with teams who gave up lots of yards but were pretty good (if not great) at preventing points. So next time you hear someone on TV going on and on about how bad a defense is because of the yards it gives up, remember: yards don’t mean anything if they don’t result in points. The next part of this series will focus on turnovers – something a lot of these “bend but don’t break” teams rely heavily upon. An obvious point: a defense’s primary goal is to prevent points. Too often, NFL “experts” and analysts will spew something like this “Team X has the 32nd ranked defense, they’re just awful! You can’t win a Super Bowl with a defense that bad!”. You’ve probably heard it a lot this year in reference to the Patriots and, perhaps, the Packers. Both teams are giving up almost unheard of amounts of yardage. Yet, I wouldn’t call either defense the “worst” or even “extremely bad”. Why? Well, games aren’t scored in yards but in points. Now, it’s true that defenses which give up tons of points tend to give up tons of yards. After all, it’s tough to score lots of points without long, touchdown producing, drives. However, that doesn’t mean that teams which give up piles of yards give up lots of yards. The 1984 Denver Broncos (who went 13-3) are a great example of a team that was “bend but not break”. 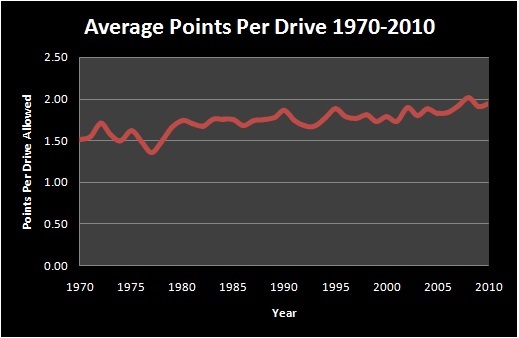 They gave up 7% more yards than league average, but allowed 30% fewer points per drive than average. Bill Belichick coached teams appear twice in the Top 20 (1994 Browns, 2003 Patriots). The 1993 Super Bowl losing Bills gave up a whopping 347 yards per game (27th ranked out of 28 teams) but only allowed a stingy 1.41 points per drive (6th best in the league). In the “Best” group, we see the 2000 Ravens ahead of the 2000 Titans. We also see a better mix of time periods represented than we did in the Adjusted PPG list from yesterday. The ability to put together a stingy defense hasn’t really changed much over time, even if league-wide scoring is up a bit. A good example of how things can change over time is the 2002 Super Bowl Champion Tampa Bay Buccaneers who allowed 52% fewer TD’s than average. 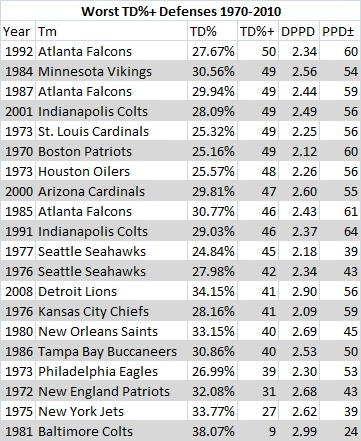 That’s 1% better than the 1977 Falcons, despite the 2002 Tampa Bay team giving up a TD on 2.29% more drives. Taking that a step further, that’s about 30% more frequently. Sounds a bit crazy, but it demonstrates the importance of taking teams’ performance relative to the league average for that given year. It’s the only way to properly account for league wide rules changes and trends. 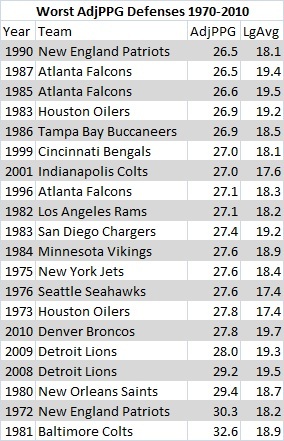 The “Worst” group is a collection of appallingly bad defenses, none worse than the 1981 Colts who gave up a TD on 38% of their opponents offensive possessions. 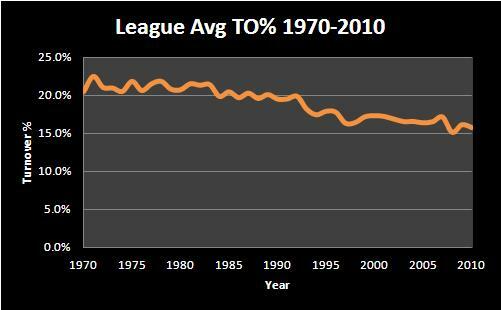 That is a staggering 91% worse than the average team allowed in 1981. 1. Field goals only represent about 19% of total points scored (about 4-4.5 points per game per team). 2. Oftentimes, holding an opposing offense to a field goal can be a “success”. Imagine a scenario where a team throws an INT at their own 15 yard line. If their defense prevents their opponent from turning that very short field into a TD, they’ve done their job. Obviously, that’s not always the case though (e.g. a team driving down in the last minute of the game for a game winning field goal). Unfortunately, it’s difficult – if not nearly impossible- to filter out “good” field goals allowed and “bad” field goals allowed. It’s best to assume that these scenarios will offset somewhat over the course of a big enough sample size. 3. A field goal is not a guaranteed score. The defense still has a chance to block the field goal, or the kicker could miss. A touchdown is always a guaranteed score, so it should get significantly more weight. The takeaway points here are that, as with the offensive efficiency rankings, Points Per Drive are the biggest thing to look at. TD% is one of the biggest determining factors of PPD but it’s not the only one. Teams which give up lots of TD’s and PPD tend to give up lots of yards but not all teams which give up lots of yards give up TD’s and PPD. Some defenses tend to give up yards but clamp down when their opponent gets near the red zone. Other defenses allow long drives but are adept at generating turnovers (and thus, limit the points they allow). Yards Per Point and Turnover % will be the subject of the next discussion. This is the first part of a series on Defensive Efficiency Scores. You can find my discussion of Offensive Efficiency Scores (O-SCORE) by clicking here. One thing which will surprise a lot of people is that the 2000 Titans score better with AdjPPG than the historic 2000 Ravens. How is that possible? The Ravens allowed 153 points to Tennessee’s 173, but Tennessee’s defense scored 5 TD’s (30 points) to the Ravens’ 1 TD (6 points). So put another way, the Ravens did more to stop their opponents from scoring, but the Titans’ D did more to positively affect the scoreboard. That said, I’m not sure of too many people – if anyone – who would put the 2000 Titans’ defense ahead of the Ravens that year. Still a lot of teams from the 1970’s, although we see the best teams from the early 2000’s jump up the list a little. Interestingly, there isn’t a single team from the 1990’s on the top 20 list (The 1999 Rams and 1990 Giants are the best of the 90’s in 29th and 30th place, respectively). The 1970 Vikings allowed 63% fewer points than league average, a truly impressive feat which will be almost impossible for anyone to top. The 1981 Colts are almost in their own class of ineptitude. They allowed 72% more points than the average team. 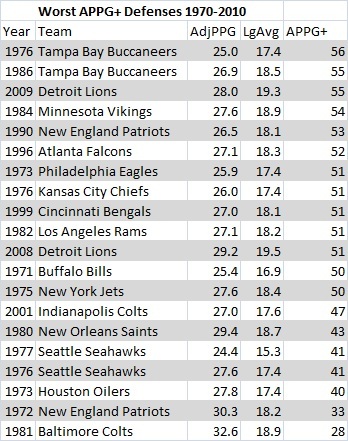 The 1972 Patriots (67%) are a somewhat close 2nd worst but after that you don’t have anyone greater than 60%. As with the offense, total PPG don’t tell the whole story. 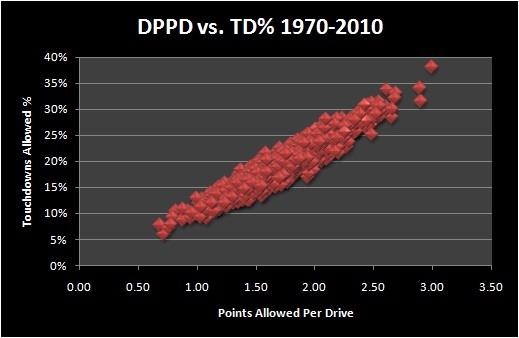 The next part of this discussion will look at Defensive Points allowed Per Drive (DPPD).